Coca-Cola intends to focus more on customer loyalty and brand love rather than actual product sales. The soda giant believes that the former leads directly to the latter anyway. After all, it was two brand loyalists who helped propel Coke to prominence on Facebook in the first place. That page now has more than 5.5 million fans, second only to President Obama. Joseph Tripodi, chief marketing and commercial officer for the company, says Coca-Cola has a new approach to customer engagement. The company wants to dig more deeply into social media and back up its paid advertising with other media projects. Tripodi says Coca-Cola will continue to create ads that reach people’s emotions and combine that with smart product placement. The new Coca-Cola strategy is to also determine those events or moments when people can be emotionally engaged and turning them into brand love and money generators. It might be a movie or the World Cup or the Olympics, but Coke plans to be there, both creatively and in all shops around the event. As they have before with the Super Bowl, the digital world will play a major part in their overall strategy. This is not your common social media for brick and mortar shop. “Join Fins” (April 2010) — In conjunction with Earth Month, there was a Facebook campaign where fans could “oceanize” themselves into an underwater photo and share it with their Facebook friends. Coca-Cola donated $1 for each person who used the app to Ocean Conservancy’s marine debris program, up to $200,000. 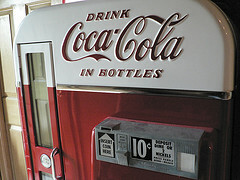 Live Positively (January 2010) — Facebook users could share a Coke-related virtual gift on the site and, in return, the company made a $1 donation to Boys & Girls Clubs of America. Gift givers also got a sneak peek at the company Super Bowl ads prior to their broadcast. For a little more insight into Coca-Cola’s social media strategy, check out the two embedded items beneath the sources cited below. The first is video of the keynote presentation from Linda Cronin, Coca-Cola’s Media & Interactive Integrated Communications Director, at the 2010 IAB Social Media Marketplace. The second is a slideshow presentation from Michael Donnelly, Group Director of Coca-Cola’s Worldwide Interactive Marketing that gives examples of the company’s “fans first” approach to social media. Image by racecarphotos, used under its Creative Commons license.